The Gift of Tears – Tammi B. Ph.D.
As a Holistic Life Counselor I often support people in navigating through the confusing terrain of grief. During the healing journey deep sadness can bubble up as suppressed emotion from the past, or by virtue of a current situation which can unleash an unexpected river of tears. Last week one of my clients was in a great deal of pain and my advice to her was: “Do not fight or suppress your tears, allow them to wash through you. Relax into your feelings without resistance and eventually you will get to the other side.” I wholeheartedly agree with Gary Zukav who has said: “Tears are the healing balm to the soul.” However, it is potentially compelling to deny our tears, build walls around our hearts and distract ourselves from pain, because it hurts to hurt. Pain is part of life – a basic ingredient of the human experience. Carl Jung has said: “Neurosis is always a substitute for legitimate suffering.” Many people walking around on planet Earth are in pain and attempt to ignore, avoid or deny it. Unexpressed emotion can cause a disconnection within oneself and create a sense of detachment. It renders us incapable of authentic empathy or compassion for ourselves or others. It can leave us feeling dull and seeing our lives through a haze or gray fog. As we attempt to squelch our pain, we also limit our ability to see the vibrant colors of joy. Many of us grew up hearing big kids don’t cry. For some, tears may be perceived as sign of weakness or vulnerability. Hurts that were too much to bear as a young person can be locked away in the closet of the subconscious, take up residence in our psyche and control our lives from behind the scenes. My advice to anyone who will listen is: “Tears are a gift. Whenever they present themselves, let them flow. Accepting and allowing them without resistance can heal us on a very deep level.” In Eastern traditions, the element of water is associated with emotion, which is meant to flow without obstruction. The shedding of tears can be a release for what is too much to sustain in the body, mind and heart. When feelings or emotions become frozen or crystallized in the energy field it can cause harm in multiple ways. Recently I had the opportunity to take my own advice. I received a phone call and was informed that a friend of mine had been killed. The news was shocking and utterly heartbreaking. As I sat down dizzy with the news, I felt my heart begin to shatter into a trillion pieces. No sense can be made of such a tragic situation, the only thing I could do was cry. I wanted to run, I wanted to hide, I wanted to escape, but there was no place I could go that would minimize the pain. And so, I acquiesced to my anguish, and I wept. The following day a friend reminded me pain and tragedy is a part of life and my dear sweet friend is in heaven and in the arms of God. He spoke to me of truth; that each person in this situation has their own curriculum and we cannot begin to understand what that might be. Though I knew his words were the “Truest Truth,” they did not alleviate my hurt. Perhaps soon I will feel a greater sense of acceptance. But for now I give myself permission to surrender to the grief and allow my tears to flow. Marianne Williamson has a powerful quote: “If you have 100 tears to cry 98 will not be enough.” Allowing all of our tears to fall is vital if we are to be healthy, happy and whole. Being fully human means be able to experience the full spectrum of emotions. I am certain most of us would prefer to avoid suffering, but if we do not only do we risk neurosis, we lose access to our inner compass and the alignment to our own heart and soul. When we avoid feeling hurt and pain we also limit our ability to experience to authentic happiness, connection and true love. What I know from having experienced loss and supporting others in walking through grief, is it can be a gift. Acknowledging and processing our deep pain can refine, hone and help us become more empathetic, compassionate, loving, soulful beings. It can increase our ability to be fully present with another as they walk through their own pain. Fully allowing our grief can open our hearts and assist us in being of greater service in the world. It also keeps us open to experiencing and embracing the higher realms of vibration such as gratitude, faith, wonder, celebration, magic, miracles and joy. So the next time you feel the sting of tears threatening the back of your eyes, remember they are not your enemy or something to suppress or ignore. Instead they are your friends, a gift and important companions on this human journey. 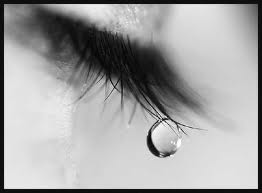 Tears are the healer of hurts, the tangible expression of emotion and the redeemer of angst. The release of all your tears can help clear confusion and lift the heavy gray clouds of grief so you can, in time, see all the brilliant, spectacular colors of the rainbow and reclaim the experience of being truly, vitally and vibrantly alive.